It has become a matter of discussion in recent years and most of all a matter of concern for most of us working in sport: video games. Athletes nowadays travel with their playing consoles around the World, spend a lot of time updating their social network sites and personal websites, watch DVD and do all sorts of things in their “downtime” which are totally different from the old times when they used to go out for a walk, play cards and/or read. Times changes, habits and behaviours change and we are all totally taken by the fast advancements in technology which nowadays provides us also with entertainment tools so small that they are able to travel with us. While the use of such tools can be seen as a useful way to keep the athletes “indoor” and avoid the dangerous temptations of wondering outside the hotels and training camps facilities, we should have a more critical approach to the problem and try to understand how we can control the use of technology to make sure that it does not become “abuse” and it starts to impair performance. I would like to discuss few examples and provide the rationale for my thinking. Ideally I would like to stimulate some discussion and possibly stimulate some research activities in this area, as I strongly believe it needs investigation as I have seen some quite spectacular effects of athletes playing all night with videogames and messing up their training and/or their competitions! First of all then, let’s discuss video games. My suggestion to all athletes travelling to Beijing last summer and to all athletes travelling to Vancouver this winter is to avoid at all costs playing video games, watching DVDs, using computers at night if they wake up because of Jet Lag. My rationale is pretty simple. In order to quickly recover from Jet Lag we need to make sure that sleep occurs at the right time of the day-night cycle. Most of the times, some athletes don’t consider getting help from sleeping tablets and tend to tackle the issue with bed routines. However, when they wake up at 3 am with their body thinking it is time for lunch or dinner, they should make every possible effort to avoid using light sources and getting back to sleep. Why that? Playing a video game on a computer or game console, using a laptop for social networking and watching a DVD can expose you to up to 300 nits (unit of measure of luminance) of light. Light exposure through the visual field has been shown in various studies to stimulate brain areas leading with circadian control and the pineal gland dealing with hormonal pulsatility. Circadian rhythms in physiological, endocrine and metabolic functioning are in fact controlled by a neural clock located in the suprachiasmatic nucleus (SCN). This structure is endogenously rhythmic and the phase of this rhythm can be reset by light information from the eye. It is therefore possible that if somebody is exposed to light of the intensity produced by laptops and similar tools coupled with physiological and psychological arousal generated by the interactive nature of the tools (e.g. video games and social networking chats) might delay adaptation to the new time zone. In simple terms, this is pretty much because light exposure is telling your brain it is time to wake up! In humans, bright light exposure early in the biological night delays circadian timing, while bright light exposure late in the biological night advances circadian timing (Khalsa et al., 2003). However, the levels of light exposure employed to shift the circadian clock have typically been fairly high, ranging from 2,500 – 10,000 lux (Crowley et al., 2003; Czeisler et al., 1990; Horowitz et al., 2001), far above the lighting received by a Laptop screen. However usually laptops and video games use is associated with physiological and psychological stress which could contribute to altered sleep patterns not only in jet-lagged subjects but also in athletes in a training camp that have not crossed any time zone. Light is not the only concern then. Playing video games has been shown to have some interesting physiological effects. 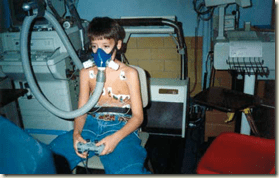 Children playing Tekken 3 (Namco Hometek Inc) where shown to have Significant increases from baseline for heart rate (18.8%; P<.001), systolic (22.3%; P<.001) and diastolic (5.8%; P=.006) blood pressure, ventilation (51.9%; P<.001), respiratory rate (54.8%; P.001), oxygen consumption (49.0%; P<.001), and energy expenditure (52.9%; P<.001). Effect sizes for these comparisons were medium or large. No significant changes were found from baseline to after video game play for lactate (18.2% increase; P=.07) and glucose (0.9% decrease;P=.59) levels (Wang & Perry 2003). Children playing for 60 minutes Need for Speed—Most Wanted (Electronic Arts, Redwood City, CA presented impaired sleep patterns and a reduction in verbal cognitive performance (Dworak et al. 2007). Despite the fact that a violent video game (Over 85% of games contain some violence, and approximately half of video games include serious violent actions [e.g., Children Now, 2001]) does not seem to determine an increase in cortisol levels (Ivarsson et al., 2009) it is clear that it is capable to provide enough physiological and psychological disruption to a normal sleeping pattern. The smaller video game literature has found that playing violent video games causes increases in aggressive behaviour, aggressive cognitions, physiological arousal, and decreases in prosocial behaviour (Anderson et al., 2004). Ivarsson et al (2009) showed a strong influence of violent video gaming on heart rate variability indices. In particular total power and very low frequency of the r-r intervals was shown to be higher while playing a violent video game as compared to a non-violent one. At the moment there is no study which has been looking at the effects of playing computer games at night on performance. However all the information I cited before seems to suggest some marked negative influences in particular if the athlete is travelling to a new time zone. So, what is the advice then? 1) If your are travelling to train and compete and are crossing time zones, avoid using your laptop, DVD player, Ipod and similar tools and video games devices during the night. Get back to sleep! 3) Recovery time is meant to be for rest and piece. You don’t want to play street fighter with your best mate and have your blood pressure, heart rate and cortisol levels go sky high because you lose! 4) There is a time and place and most of all a duration for your gaming and computing activities, make sure you don’t negatively affect your performance because of that!